Wouldn’t it be cool if there was a way to get the perfect picture with the click of a button on your smart phone by cameras set up in places you want your picture taken? What if that one click would simultaneously send the photo to your phone, your Facebook, your Twitter and (sometimes!) even your Mom? That is ArchCam and that is why you should be passionate about our product! ArchCam is a system of cameras set up at key photo-op locations around campus (the Arch, Tate II, and Sanford Stadium). These cameras are set to take a picture when you scan a QR code and following a few, simple directions. At each location, a code is conveniently placed for your smart phone. The QR then brings up a mobile site with the appropriate directions for the camera at your location. This website activates the camera which takes a photo of you and your friends and uploads it to the web. 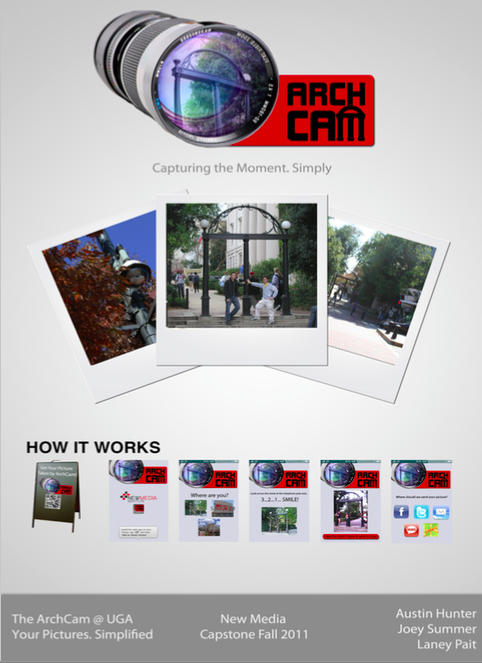 Everything is integrated, and ArchCam makes it easy for you to share your photos from UGA any way you’d like! So get to snapping some great pics!